Hong Kong’s Cold War <寒戰> started a media frenzy when the film’s producers and actors touted the film to be the best Hong Kong police thriller in ten years. Many were unsure if the film would outperform 2002’s Infernal Affairs <無間道>, while others were more than eager to finally see another high-quality Hong Kong-made cop film. And judging from the film’s box office performance, it seems that Cold War may reach the success level that Infernal Affairs had set. Cold War was released in Hong Kong, Macau, and mainland China to full houses on November 8. Five days later, Cold War grossed over $100 million at the box office. The film was critically acclaimed. Some critics agreed that Cold War has made Hong Kong’s film industry finally achieve another high level, while other critics simply gave the film two thumbs up and a big recommendation stamp. 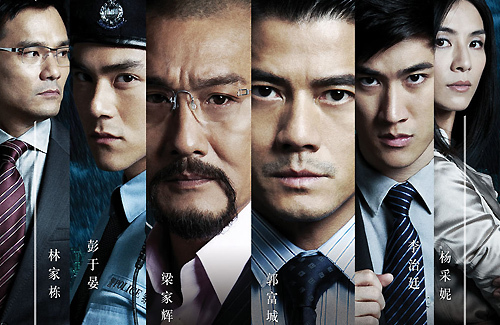 Cold War stars Aaron Kwok (郭富城) and Tony Leung Ka-Fai (梁家輝) as two senior police officers who are competing in an internal political power struggle. According to Tony, Cold War is a movie “made by Hong Kong people for the Hong Kong people,” and that this local “Hong Kong flavor” has not been seen since Infernal Affairs. Cold War also opened in New Zealand, Australia, and Malaysia on November 8. The film was released in Singapore on November 15 and Taiwan on November 16. Yes Charlie Yeung is in “Cold War”. Glad Eddie is becoming a big star! Go Eddie! Yes I’m so glad to see that he’s getting the popularity he deserves!! I soooooo can’t wait to watch Da mo yao, I hope they hurry it up already!!! loved it! plan to watch it again! This is one movie with the most noise. I have high opinion of infernal affairs and if it is half as good, perhaps. But is it all noise but average substance? Tony Leung and Aaron Kwok at their best!!! It’s just normal to me but are we supposed to pat ourselves on the back for the typical Chinese decision made near the end of the movie? Tony Leung Kar Fai reminded me of Toisan Albert from Aces Go Places at the end of the movie. I don’t understand the hype over his performance at all.